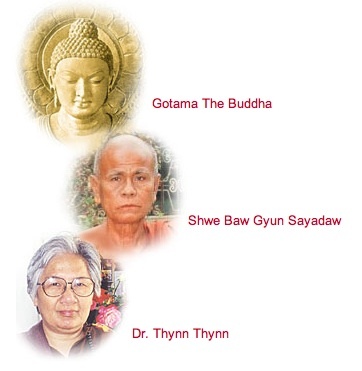 Dr. Thynn is the lineage holder of the Shwe Baw Gyun Burmese Buddhist tradition. The lineage is from the mystical tradition (samatha) of Buddhism in Burma. The mission of the lineage is to be custodian of the Teachings (Buddhist Sasana), which originated during the life of Gautama Buddha, 2,600 years ago. This will continue until the next Buddha’s Sasana (Maitreya Buddha). The lineage is passed on from generation to generation by people who are born into, and subsequently awakened to the tradition. Dr. Thynn Thynn’s teacher, the late Ven. Shwe Baw Gyun Sayadaw, was one of the foremost Samatha Masters in Burma, who lovingly gave spiritual guidance to thousands of devotees. The most outstanding feature of his life’s work is the success of the Sae Taw Win Monastery in Burma. It was a dhamma sanctuary for all those who sought refuge in the Dhamma and the Sayadaw. Dr. Thynn’s endeavors in the west are a continuation of her Master’s work, and satisfies one of the great needs of our time – to build peaceful, spiritually-satisfying communities. The Sae Taw Win II Dhamma Center in Northern California is such a manifestation – a gentle healing place for those seeking a genuine, fulfilling, spiritually minded way of life.